BCF Teacher featured in Himalaya Magazine! BCF Alumni Sabrina Soares spent a year teaching in Bhutan with us in 2012. Throughout her year in Bhutan, Sabrina regularly entertained her readership on her blog Sabrina in Bhutan with fantastic stories, mesmerising photos, and engaging experiences. In the 2014 spring edition of Himalaya Magazine, Sabrina continues to share her journey to Bhutan and her first impression of the magical kingdom in a five page spread! “I believe I made it to Bhutan despite the odds because of the power of love for a dream; when you feel a calling to do something or when you feel that your heart is lit with a burning desire, faith can move you in directions that we can’t always see.” – Sabrina Soares “How did I end up in Bhutan?”. Himalaya Magazine is the leading travel magazine for the entire eastern Himalayas – visit their website at http://himalayasnepal.com. To purchase a Digital Copy of the 2014 Spring Edition, please visit Subscriptions – Himalaya. Download a PDF copy of Sabrina’s story by clicking here -> Himalayas Magazine – Sabrina in Bhutan (Spring 2014). BCF teacher Matt Stretton recently wrote an article for Druk Air’s Tashi Delek in-flight magazine! 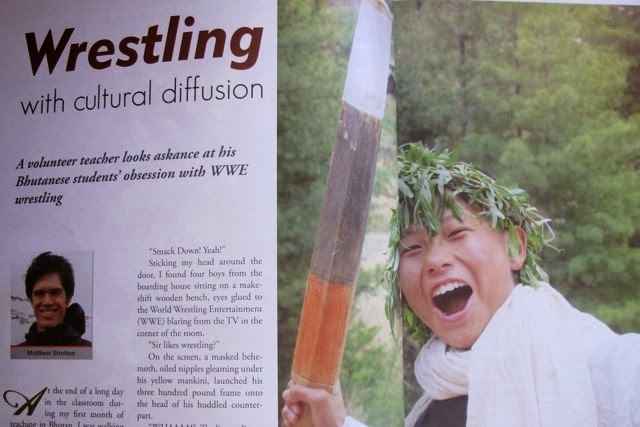 In his article he ponders the reason behind the popularity of WWE wrestling amongst some of his students and takes a thoughtful look on the impacts of cultural diffusion in Bhutan. Sticking my head around the door, I found four boys from the boarding hostel sitting on a makeshift wooden bench, eyes glued to the World Wrestling Entertainment (WWE) blaring from the TV in the corner of the room. Read his full article Wrestling with Cultural Diffusion in Bhutan on his blog!